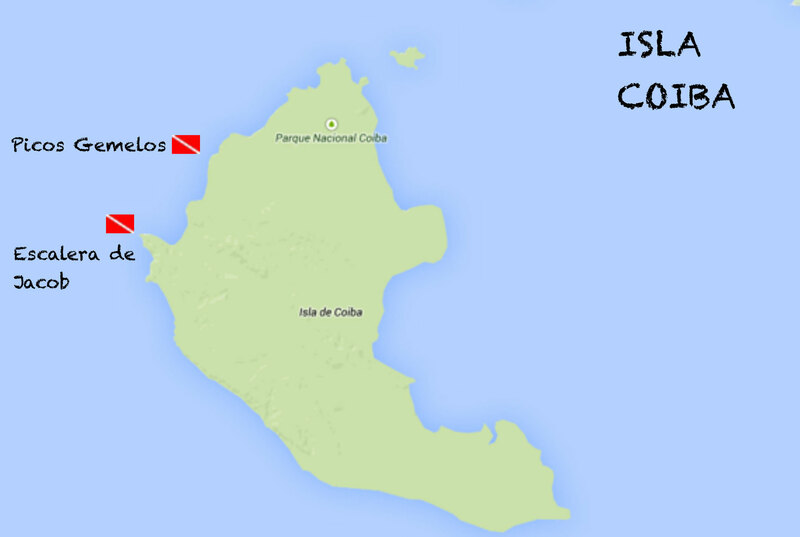 There are many dive sites close to the main island of Coiba and others that are a bit further and require some planning to get to. We have included descriptions of some of the most popular dive spots in the park. Hover over the Dive Sites to see a description. Usually protected from strong currents, these two rocks emerge out of the further descending slope of sand at 21 meters and reach up to a depth of 8 meters. An abundance of gorgonians, sea fans, hard coral and sponges can be found on the walls of these and the surrounding rocks. Possible marine life: morays, frog fish, seahorse, jacks, barracuda, Mantas and other rays, white tips and whale shark. Exposed to strong currents due to its proximity to some of the deepest waters in the park, this pinnacle surrounded by various large rocks can be found at 16 meters and falls abruptly to much more than 40 meters. It is covered in white gorgonians. Possible marine life: white-tip, eagle ray, devil ray, Manta, sea bass, turtles, marlin, sailfish, schools of jacks, snappers and barracuda. Exposed to eastern-flowing currents, the depths of this island are formed by a gentle slope to sandy bottom at 28 meters. The dive usually begins on the southern side, and if conditions allow, you can get to the calmer other side of the island. Possible marine life: frogfish, green moray, jacks, barracuda and spadefish. A little deeper: eagle rays, Mantas, groupers snappers, green turtles, white tips and bull shark can be found. Suitable for intermediate and advanced divers and for snorkelers. 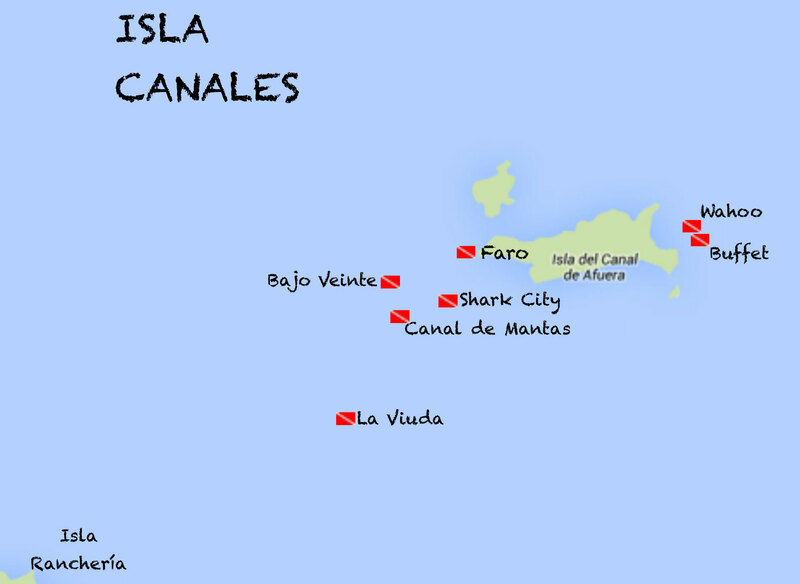 Located between Wahoo and Isla Canales there are various large rocky areas full of life. Descending to a maximum of 30 meters, you can dive along the sandy bottom connecting the reef systems. Suitable for intermediate and advanced divers. Initially descending to 6 meters, the dive continues towards the east through an array of large rocks down to 26 meters. Terraces of sand and rock can be found at this site that sometimes is affected by strong currents coming through the canal, which can make for excellent drift dives. Possible marine life: Mantas, eagle rays, white tips, spadefish and jacks. In the canal between Isla Ranchería and Canales, three pinnacles rise from 50 up to 27 meters. They form a triangle around a sandbar where temperatures can be as much as 5 ˚C lower than at the surface. Dives tend to be short due to the depth, and safety stops are usually done in the blue, floating with the current. Possible marine life: eagle rays, mantas, devil rays, groupers, snappers, jacks, green turtle, white tips. During high tide, the top part of the two biggest pinnacles is at more than 20 meters, hence it´s name. Between the two stones, one finds sandy bottom scattered with rocks. At about 40 meters, one hits a forest of gorgonians where giant grouper can be found. Strong currents can make this a more difficult dive, but they also bring in tons of life. Expect changes in visibility and temperature. The dives are usually short due to the depth, and safety stops are done in the blue, floating with the current. The dive leads from the highest rock at six meters down to the sandy bottoms of the canal at 26 meters, where strong currents can often be found. Possible marine life: Mantas and eagle ray, white tips, jacks, spadefish. Hard and soft corals and two cleaning stations with plenty of butterfly fish and cleaner wrasses. Frogfish and seahorse can also be found. The driest part of these pinnacles being at 14 meters, strong currents can rip through the 20-meter-deep canyon between them. The southernmost pinnacle ´s terraces fall quickly to over 40 meters where a garden of gorgonians can be found. This spot is better explored between tides, when currents are less daunting. Possible marine life: Schools of big-eye jack and Mexican barracuda, white tips and Mantas, snappers and groupers. The western side of this pinnacle is exposed to strong surf from the open ocean often bringing in strong currents. The depth ranges from 14 to 42 meters. Possible marine life: bull shark, frog fish, devil rays. Gorgonians. The western side of this pinnacle is exposed to strong surf from the open ocean which often brings in strong currents. The depth ranges from 8 to 42 meters. At about 30 meters, there is a cave on the southern side of the rock. Possible marine life: schools of bigeye jack and Mexican barracuda, red snappers, sea bass, bull shark, white tip, Manta rays, frog fish, devil rays. Gorgonians. Dropping to 9 meters, close to a rock that looks like a finger, this dive site has walls going deeper than the limits for recreational diving. Currents, surge and surf are common here. Hard and soft coral can be found along this wall. Possible marine life: schools of snappers, jacks, barracudas, eagle rays. Mantas, bull shark, white tips, morays, lobster, octopus. Surrounded by deep, open ocean, 5 cleaning stations have been identified on this array of giant rocks. Swim-throughs and valleys have been created by the constant currents and surf. 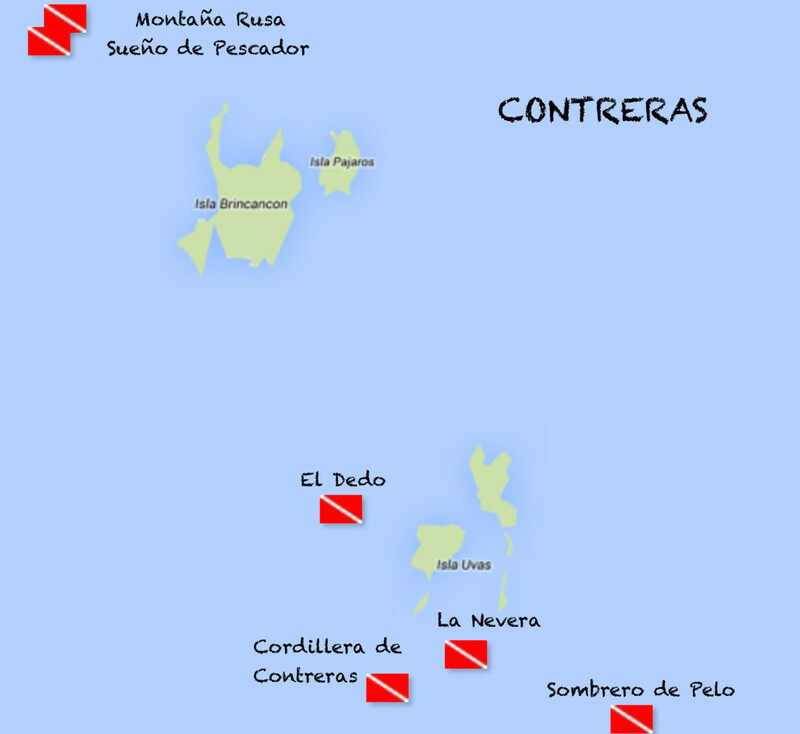 This large area allows for various dive plans, usually based on the direction of the current. Possible marine life: Schools of jacks, snapper, barracuda and spade fish. Mantas, eagle rays, bull shark, white-tip. Lobster, octopus, morays, frog fish, seahorse. Exposing its peak during low tide, this rock quickly drops from 8 to 40 meters on three sides. On the southern side, a canal ends at a small cave in the wall where lots of hard and soft coral can be found. Possible marine life: Mantas, white-tip, bull shark. At depth, sea bass and snapper. Schools of jacks and spade fish. Hawksbill and green turtle. Protruding above the surface, this rock, in the shape of a hat, is home to some of the most beautiful soft coral in the area. Dropping to depths further than recreational diving limits allow, this site has various options for exploration, usually dependent on the current. Suitable for intermediate to advanced divers. This dive site is one of the most colourful reefs in the park. The shallow part between 5 and 15 meters has beautiful coral, making it ideal for shallow dives. The divers can explore the deeper reef system which descends to about 25 meters, and is also full of life and colour. Possible marine life: seahorses, mobulas, white tips, milkfish, snappers, jacks. Suitable for all levels of diving and snorkeling. 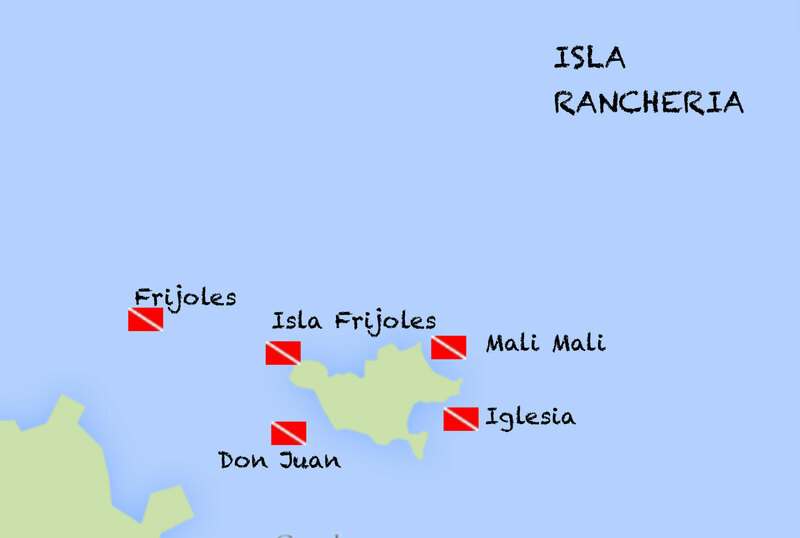 If conditions allow, one can be circumnavigated the island completely during a shallow, maximum 15-meter dive. Possible marine life: schools of jacks, barracuda and spade fish. White tips, Panamic pork fish, turtles, damsels and butterfly fish at cleaning stations. Suitable for all levels and snorkelers. With thousands of rocks of all sizes scattered on the ocean floor, the dive sometimes begins at the highest one at 11 meters. When currents change, so does the entry point. It is an excellent site for drift dives. The rocks form various terraces that descend to 33 meters where hitting sandy bottom. Possible marine life: On the southern side: seahorse, frog fish, morays, jacks, barracuda and spade fish. On the northern side: eagle rays, Mantas, sea bass, snappers, green turtle and white tips. Dropping to 9 meters, this dive leads us in between various-sized rocks down to maximum 33 meters. Varying between gravel and sand, the dive ends at one of the other two buoys located around Iglesia Island. Possible marine life: morays, frog fish, seahorse, jacks, barracuda, rays. Suitable for all levels and snorkeling. Always protruding above the surface, the group of rocks ends in sand on the northern and southern side at about 8 metres, on the western and eastern side at about 18 metros. Possible marine life: octopus, nubibranch, sting rays, white tips, nurse shark, hawksbill and green turtle, schools of big-eye jacks and blue and gold snappers. Suitable for intermediate and advanced dives.